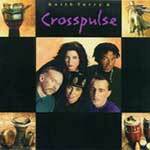 Crosspulse's first recording, released in 1994 (currently available on cassette only). Featuring Edgardo Cambón, Raymond Graham, Susu Pampanin, Jackeline Rago and Keith Terry, with guest artists Rowan Jiminez, Erika Luckett, Andy Narell and I Nyoman Windha. Produced by Keith Terry and Andy Narell. Tight and grooving...a huge assortment of sounds and emotions. A world of voice and percussion that reflects the primitive roots of all music, skin on skin and the human breath...an emotional force beyond words.